Anyone familiar with computers will know the famous stories of the enterprising young men who started Google and Yahoo in the USA. That, however, is not a far-fetched dream. What started off as a dream started off by a group of visionary young computer students at the University of Papua New Guinea has now become a thriving business. Itel (PNG) Microtech is a young new Information and Communications Technology (ICT) company started by young graduates of UPNG, which specialises in removing computer viruses. 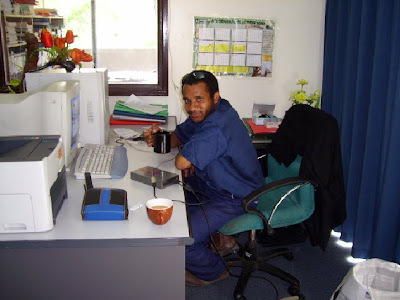 It was founded as a student academic group at the UPNG Waigani campus in 2006 by Panu Kasar, a young man of Madang and Morobean parentage, doing IT Services of PC repairs, printing, scanning and computer virus removal. It was a group which consisted of students of the Electronic Computing Strand. The aim was to start a business of the same name after completing studies. It was initially started as Itel PNG, IT for information technology and EL for electronics. So strong was the desire to start business, however, after completing school, all members went their own ways, due to the hardships in life faced outside the campus, leaving only Kasar. Having determination and courage of starting the business, which he initiated, he pursued the dream, while everyone who knew, were watching to see if he would still continue with the idea or give up. Giving up would be an insult to him, so against all odds, he struggled all through 2007, putting up notices on public notice boards and doing part-time freelance jobs. By then, he had saved enough money which enabled him to purchase more equipment. He also registered the business and opened a bank account within the same year. He was then ready to provide competition to existing firms and realise his dream of being founder of his very own IT firm. Upon registration with IPA, the business was registered as Itel (PNG) Microtech in 2007.
Business started at a residential house at Waigani until November 2007, when an office space was sought at Five-Mile. More equipment was purchased including new computers for the business. With the new office, the client base increased, which saw contracts obtained from new business partners. Four new members added extra manpower to the business, giving strength and hope to the new business. “It took a year to fully experiment and carefully test the IT industry before drawing up marketing strategies,” Kasar says. “The boys had decided to focus at a more specific area than general IT. “Using the Itel (PNG) Microtech banner, we initiated The PC Clinic to specialise in Computer Virus Removal and Scanning. “It is sort of a PC Pest Control Service; it became one of the first to fully specialise in that field of IT, that is, virus removal. “During our one year of experimenting, we tested all sorts of viruses and made a tally of them. “From these, we were able to purchase specific software, removal tool and fixes for each viral threat. “We even went as far as infecting our own computers and stayed up all night to figure the counter active measures through careful study of their behavior patterns and symptoms. “With each exposure, we have gained invaluable knowledge and experience in this specific field, and it is our dream to become the ‘best’ as the years go by. “This service is in great demand, due to the increase in PC users in Port Moresby. “Latest threats identified by The PC Clinic are the destruction of data by a virus known as infostealer aka W32.Gammina. “This virus hides all data in the flash USB disc, making files inaccessible. “The files exist but they become hidden for the user to access. “This has caused frustration to the point that the user formats the USB drive, destroying all the data present. “The PC Clinic provides solutions to this through data recovery techniques. Anti virus software definition updating. The PC Clinic has established business ties with various government departments as well as business houses. It monitor their systems on a monthly basis, updating their anti virus software and checking their infection rates. Apart from The PC Clinic, other services are also provided such as website designing, basic PC repairs, database designing and management. “Our aim is to further the Gospel of the Lord Jesus Christ by supporting Ministry,” Kasar reveals. “We believe in ourselves and want to become role models for upcoming PNG businessmen and women in the technological industry. “It is our desire to tell Papua New Guineans that all success is a result of hard work and nothing comes free. “Lazy people have no place in this country! “ If only Papua New Guineans stop criticising and start doing what they were born to do, this nation would rise up to the competitive global arena. “It’s not about money but simply doing what you were born to do, excelling in it thus fulfilling the purpose of your life by helping others”. The PC Clinic Crew can be contacted on telephone 325 8912 or 6890616 or72072701 and email http://us.f529.mail.yahoo.com/ym/Compose?To=pkasar@mail.com . Their service is on the spot and available 24 hours a day. A quite revolution is taking place in Papua New Guinea which promises to bring about massive development to our beloved country. This is the development of what is known as PNGARNet, short for Papua New Guinea Academic and Research Network, which is being spearheaded by our universities, in particular the Divine Word University in Madang. PNGARNET, set to be launched next month, is a company wholly-owned by the PNG Vice-Chancellors Committee. PNGARNET was formed with the express purpose of facilitating the efficient cost-effective delivery of Internet services to Institutions of Higher Education (IHE) and research in PNG so that PNG tertiary students can receive a world-class education. Potentially, all those organisations, which are part of the Office of Higher Education (OHE) in PNG, can become involved in PNGARNET. In its initial and start-up phase, the original formation group of the PNG universities is spearheading the development. The Universities of PNG are either state-funded or non state-funded. The state-funded universities are University of Goroka, University of Papua New Guinea, University of Technology and Vudal University. The non state-funded universities are Divine Word University and Pacific Adventist University. These six universities are the founding institutions of PNGARNET along with National Research Institute (NRI) and National Agricultural Research Institute (NARI). PNGARNET is providing efficient Internet resources to its members through a satellite Virtual Local Area Network (VLAN). The typology of PNGARNET attempts to provide each member institution with complete institutional integrity as well a provide potentials for intercommunications. At Divine Word University in Madang last weekend, I was able to see for myself initial work on this exciting project, which promises to bring about untold development. PNGARNET was formed three years ago by the OHE and its stakeholders, the six universities, with DWU’s visionary president Father Jan Czuba appointed as chairman to commence dialogue with Telikom and PANGTEL. “The benefits will be tremendous,” Fr Czuba said in an interview. “The whole approach to teaching and learning in PNG will change. “Having access to information will significantly reduce the cost of higher education. 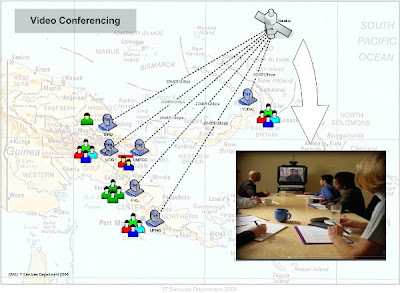 “Instead of flying in professors, they can teach using video conferencing. “To improve our quality of higher education, we need to have resources, which are very expensive. “The PNGARNET will allow have student to have access (to these resources). Fr Czuba said ARNET had the full backing of Prime Minister Sir Michael Somare and his Ministers. The PNGARNET system is designed around a VLAN implemented through satellite technology. It is designed to help answer the challenge that the universities of PNG offer a quality education to PNG citizens. The third PNG National Educational Plan offers the challenge that the universities provide a world class education to its citizens. This plan presumes that PNG tertiary students will be able to access the learning resources that are commonly provided via Internet connections, thus, PNG students must become world learners. PNGARNET will employ satellite technology to link the universities of PNG to each other and to the World Wide Web. To achieve this linkage, PNGARNET provides the infrastructure to coordinate the satellite system. PNGARNET enables the satellite dishes to coordinate with central servers, which happen to be installed at this point in time, in Hong Kong. The company, PNGARNET, also provides the central skill base in order to train staff for each institution. PNGARNET is designed to not limit the independence of any university and to maximise the skill sharing for all universities. The vision of PNGARNET is that this satellite link will connect all the institutions of higher education in PNG. This linking will take time, and in the first stages, the major partners are all the universities of PNG, NRI and NARI. It is hoped that other institutions of higher education will join the scheme as funding becomes available, as they grow in confidence in the scheme, and as the scheme matures into benefits for PNG tertiary students. It is also anticipated that other schemes will evolve, similar to PNGARNET, for higher education. It is hoped that hospitals and secondary schools might also develop similar projects to enhance their provision of services and to better attain their goals. PNGARNET has the mission to provide efficient, cost-effective Internet to institutions of higher education in PNG. The objectives of PNGARNET are simple ones. These objectives are to offer PNG higher education institutions increased bandwidth that is reliable, cost effective and of a bandwidth suitable to be educationally advantageous. At the same time, PNGARNET seeks to maintain and promote institutional independence and encourage collaboration. Further, PNGARNET seeks to develop skills and ICT capacities in all its institutions by enabling skill-sharing, inter-institution training, and bringing new skills sets into play. As these possibilities are exploited and used in daily teaching and administration tasks, then the goals of PNGARNET are being achieved. Chandana Silva, ICT manager of DWU, and his team have collated the equipment needs of the major initial PNGARNET partners. The equipment including satellite dishes, antennae and Block Up Converters (BUCs) – a device used in the transmission of satellite signals - for the sites of the PNGARNET partners has been sourced mainly from China. The coordination of this equipment has been a large undertaking. Mr Silva is in Hong Kong this week to commission the PNGARNet set-up there in time for the launch next month. ARNET is indeed a giant step in the right direction for Papua New Guinea. I was pleasantly surprised this week to receive a visit from my good friend, writer and former colleague at the Coffee Industry Corporation in Goroka, Tiri Kuimbakul. He came into my office at The National after collecting five samples of his new book, Young Money, which were hot off the press at The National’s sister company, Star Printers. It is expected to be launched later this month by none other than the country’s most-prolific book author and Governor-General Sir Paulias Matane. It includes a foreword by Samuel Tam, founder of the famous Personal Viability Programme, and is a huge vote-of-confidence in the book. The excited Kuimbakul handed me one of the first copies of Young Money, which like its predecessor Success after Graduation, is destined to become a runaway bestseller in Papua New Guinea. Young Money basically touches on what working class people need to know and do to achieve financial independence and freedom. If you have been academically bright or are professionally successful, does that necessarily mean that you are financially successful? According to this book, the answer is NO! But everyone, including you, can succeed financially. Here is what you need to know and do to achieve financial independence and freedom. In order to succeed in the area of personal finance, you need to budget your money, know what are needs, wants, assets and liabilities, avoid bad spending habits (such as betelnut, cigarettes, alcohol and poker machines), control your cashflow, save and invest (rather than continue to borrow money from the ‘money market’ down the road). This book covers all these and more, and has been written with your financial success in mind. In 21st Century Papua New Guinea, or wherever you may be reading from, financial success is so vital that if you fail financially, you fail in every other area of life. Every other area of your life is influenced by how much money you earn and what you do with it. This book is about what you do with your money. If you apply the common-sense advice in this book, you will succeed where 95% of working class people have failed all over the world. “I wrote this book in view of the fact that many people are struggling financially,” Kuimbakul tells me. “Most are living in debt. “What I found out is that it’s not because we don’t earn enough. “This may be true in some aspects, but generally, what people earn is sufficient, but the problem is management. “I wrote the book to help working people manage their personal finances. “That’s what I want to get across to the people. “It’s not how much you earn that matters, what matters is what you do with what you earn. “Financial success is so vital that if you fail financially, you fail in every other area of life. Kuimbakul’s first book Success after Graduation has become a runaway bestseller since its launch in November 2006. Since the launch of the book – aimed at young people in general – hundreds of copies have been sold all over the country. And his star has continued to rise since the launch, with interviews with both local and overseas media; a weekly newspaper column for young people; and meeting many people personally and through an avalanche of emails, faxes, letters, and telephone calls. This was all something new for the quietly-spoken layman pastor. “When I first came upon the idea of writing books sometime in July 2005, I did not know what lay ahead of me,” he reflects. “It has been like launching out into deep waters not knowing what will happen. “It has really been a journey of faith. “And I have met so many people I would never have known had I not written this book, many through correspondence. Kuimbakul, 42, is from Mount Hagen in the Western Highlands, however, graduated with an honours degree in economics from University of Papua New Guinea in 1988. He currently manages coffee marketing projects, advises community development associations, does church work, writes and publishes books, conducts seminars, and speaks to students and young people when he gets the opportunity. Young Money was actually completed last year and was supposed to have been printed then but this was put off by a year. “My third book is titled ‘Be Your Own Boss’,” Kuimbakul continues. “It’s aimed at motivating people or readers, especially students and unemployed youth, to go into business for themselves. “I’m trying to relate all these books to one another. “My plan is to have 10 books out by the end of 2010. “These books will cover how people can succeed in school, professionally and financially. “I’m writing four other books aimed at empowering students to do well. “From these four books, I have developed a workshop which I’m calling Academic Excellence Workshop. “This workshop will take students through areas such as goal setting, time management, note taking, revision, preparation for exams, etc. Young Money. By Tiri Kuimbakul. Published by SECOS Books. Goroka, 2007. 180 pages. ISBN 9980-86 -038-3. K60.Phone/fax: (675) 7323950. Mobile: (675) 6880033. Email: secos@global.net.pg . Many people who have been long fascinated by the story of the gold rush days of the 1930’s, feel that history is being rewritten with the re-opening of the Bulolo Airport. Built in June 1930, originally the Bulolo strip was 1,150 yards by 120 yards. Later it was expanded to 1,300 yards in length, covered with grass. This airstrip was used in conjunction with flying supplies and equipment for gold dredging at Wau and Bulolo. On January 21, 1942, Japanese Zeros and bombers attacked Bulolo. At Bulolo, they set fire to three of the Junkers G31 tri-motors on the ground, destroying them. Gold dredging work ceased as most of the men employed entered military service. Five days, later, on February 5, 1942, Bulolo was bombed at 11am by five twin-engine bombers. The rigours and cost of the eight-day walk into the goldfields and the difficulty of building a road from the coast led to the early introduction of an aviation service. The driving force behind the development of the goldfields was Cecil J. Levien, a former Morobe District Officer, who has been described as a “rare and formidable combination of opportunist, practical man and visionary”. After two unsuccessful flights around the mountains south of the Markham no one knew exactly how to find Wau from the air. Mustar landed at Wau for the first time on April 16, 1937. He began the service the next day with a shipment of six 100 lb bags of rice, charging a shilling a 16, and, making two trips a day, five days a week, carried 84 passengers and 27, 000 lbs of cargo in the first three months. Ray Parer, the proprietor of Bulolo Goldfields Air Service who had been competing keenly with Mustar to be the first to land at Lae, came from Rabaul after many delays, and A. “Jerry” Pentland and P. “Skip” Moody soon joined them. There was ample business for all, and by April 1928, a year after the service began, Guinea Airways (the aviation company that grew from Guinea Gold N.L.) had acquired two extra planes and was employing three further pilots and two more mechanics. 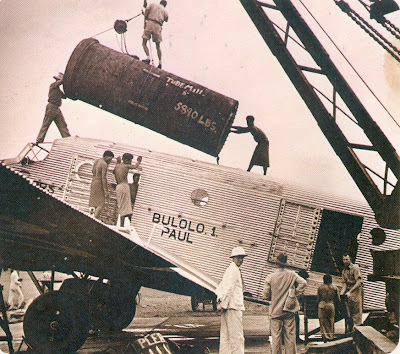 Then in March 1929 a new company, Morlae Airlines, began a weekly Lae-Port Moresby run, meeting ships from Australia and bringing passengers and frozen foods across to Wau, Bulolo, Salamaua and Lae. At first Bulolo Gold Dredging Ltd and its parent company, Placer Development Ltd, had thought of building a road to the goldfields, but the length of time it would take and the high cost of construction and maintenance persuaded the companies to accept Guinea Airways' proposition that “skyways are the cheapest highways”. The airlift was a remarkable undertaking. It pioneered the use of aviation in the transport of heavy cargo and, in the words of one writer, “in every respect it constituted a world record”.